Perfect size, display up to a 50-Inch diagonal image, fit any tabletop; 4:3 projection, fit projectors well. Fast, easy setup on tabletops, quickly open up, ready to display in seconds, save time for presentation. Made of High strength material, stand is sturdy and durable, keep stable standing up. 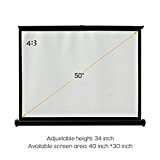 Whether you’re walking across town,commuting by car or flying to your next destination,this lightweight, compact screen is the perfect travelling partner for on-the-go presentations. When you’re ready to present,this screen allows you to set up quickly and easily on any tabletop in less than 30S. This entry was posted in Computer Desktops and tagged Foldable, Home, Portable, Projection, Projector, Pull, Screen, Tabletop, Theater/Office/Business/Outdoor by Express Computer Supplies. Bookmark the permalink.